I wrote “Oomisoka“. It means “New Year’s Eve” in English. “Misoka” is the last day of the month, and “Oomisoka” is the last day of the year. On new year’s eve, we eat Soba ( buckwheat noodles ) for our good health and “Joya no Kane” ( bells ringing out the old year ) are struck at temples. 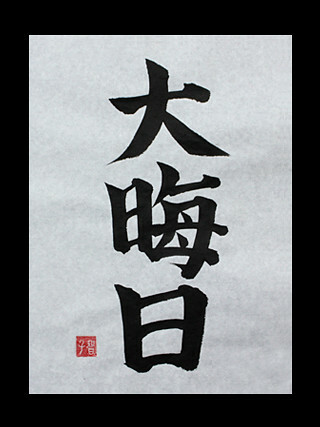 Next Post “Gashou” – Japanese Kanji Symbols for A Happy New Year!